Photographs by others: The competitors at Seeburg- See , Germany, 2008. The competitors at Seeburg- See , Germany, 2008. 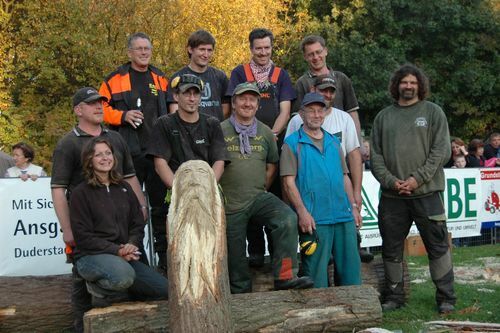 This is a photo of all the chainsaw carvers at the the chainsaw carving event at Seeburg see, Germany in October, 2008. Michael Knuedel from germany did a magnificent job with his wife Maria in organising the event. From left to right - back row: Me, Florian (Germany), Rolf (Holland), One of the Winkler brothers(germany). Front row: Mike Winkler (Germany) and Zoe Boni in front of him (USA), Jamie Doeren (USA), Michaek Knuedel (Germany), Luc (Belgium) and Rudi (Germany). The photo was supplied by Marko Kellner.